Wouldn’t you need a queuing mechanism on the IT/OPS/JS level? If you work with ASP.NET WebAPI you can use batching support and such little library: https://gist.github.com/rosieks/bf4e0a78147f28687e89 in order to send multiple requests as one physical. Unfortunatelly if you want to process it transactionally you need to create your own BatchHandler that create TransactionScope. Nice post – short and clear. Why you choose to name it “IT/Ops” for something that looks like aggregation? Might be just my experience, but this name requires additional explanation when you explain it to others. In this example http://blog.hansenfreddy.com/2011/07/07/tabular-data-composition-in-the-browser-for-soa/, is it possible to make one physical call? The problem is that the marketing service needs to have product IDs from the sales service before it can query the description field from the marketing service. So, when we want to composite data to a grid from multiple services, we need to make at least two calls, one to get correlation IDs and the second call to retrieve the other data from the services. In this case, it would be easiest to do 2 calls – the first to get the IDs, the second, to pull back all the other data as shown in this post. 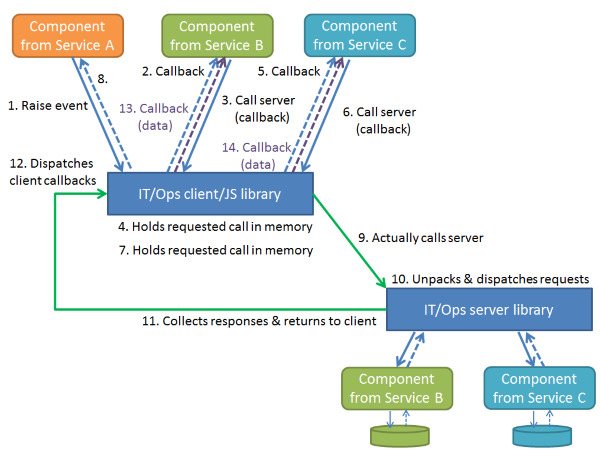 While it is possible to move to a server-side model for event-composition, it requires a bit of a different approach.